The Goods and Services Tax was implemented in Malaysia commencing April 2015. All persons, not just registered businesses, conducting business with an annual gross turnover of RM500.000.00 per annum or more, were required to register with Customs. Once registered, a person or business was required to comply with the rules and regulations, including keeping track of GST collected as well as GST paid and account for it either on a monthly or quarterly basis. MYOB Accounting and MYOB Premier, starting with versions 20 and 15 respectively removes the administrative overhead of managing and complying with GST requirements. Since then, MYOB has remained compliant with changes in the GST rules and regulations by coming out with upgrades. The current versions, MYOB Accounting v24 and MYOB Premier v19 make compliance easy to manage. Have the relevant GST tax codes available for use with transactions. Be able to produce the GST-03 either on a monthly or quarterly basis. 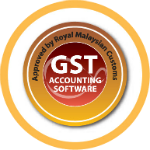 Be able to produce the GST Audit File when requested by Customs. Read on to find out how MYOB helps reduce the administrative overhead of complying with GST requirements.